Coffee First: The first scrub I tried because well... coffee addict here! I have been using Coffee First as a face mask, facial cleanser and body scrub in the shower. It's perfect in the morning to real give my body the wake-up call it needs. After one use I noticed a difference- my face was literally glowing and so hydrated! And, after multiple uses I have noticed how well it banishes any sort of blemishes! Coffee First is great for eczema, cellulite and also to treat acne. The blend of coffee, sweet orange oil and sweet almond oil make this scrub smell fantastic, and a little really does go a long way! Lavender & Lemon: Doesn't the name just sound soothing? This has become my go-to bath scrub. After a long day, or work out, jumping into the bath tub and rubbing a handful of Lavender & Lemon all over is pure bliss. Lavender & Lemon relaxes the skin, hydrates completely, and leaves you feeling silky smooth all over. Bonus- the smell reminds me of our stay on The Côte d'Azur where the smell of lavender was hypnotizing. Citrus Mistress: After using the other two scrubs, I didn't think it could get better! From the second this scrub touched my skin it felt like a tropical explosion of hydration. The citrus scent combines with coconut oil for the most incredible aroma, and I am being completely honest when I exclaim how incredible the hydrating properties are. I use Citrus Mistress in the shower and as an occasional face mask before bed. The coconut oil in Citrus Mistress allows it to double as a makeup remover and all natural shave scrub, too. Amazing. Pucker Up: My lips have always been a problem area for me during the winter; the furnace, the car heater, the extreme cold and wind...they all do a number on me. Once a day I massage a tiny bit of the sugary scrub onto my lips, wait a minute and rinse off. The result? Smooth, silky lips. The citrus aroma makes it so tempting to lick off -and I may or may not have on occasion- but it's totally natural! There are so many questionable ingredients put into skin care products and what's the point of eating healthy and living clean if you are still damaging the only skin you are fortunate to have? 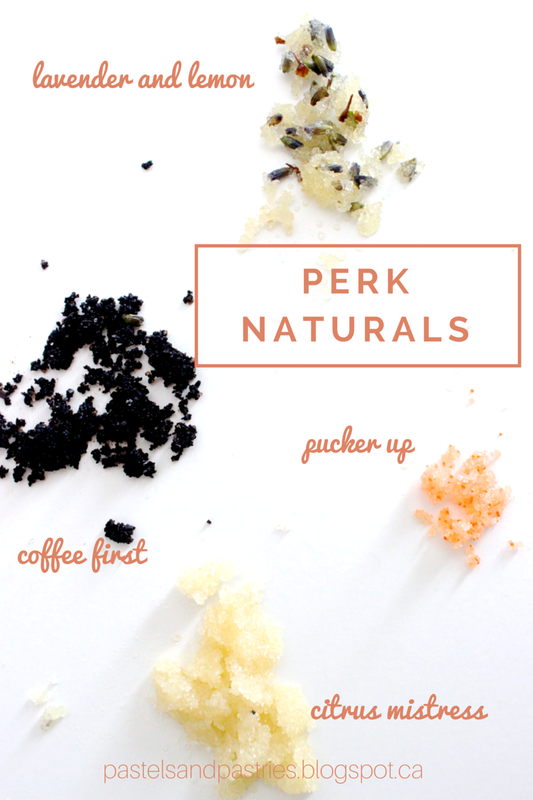 I urge you to try out Perk Naturals. You will fall in love with the purity of these products and your skin. **A huge thank you to Emily and Perk Naturals for allowing me to review these lovely products. These opinions are one hundred percent my own. Visit Perk's Facebook page here. Purchase Perk on Etsy here. pastels & pastries has teamed up with Perk to raffle off one amazing Perk Naturals Prize Pack (1 Coffee First, 1 Lavender & Lemon, 1 Pucker Up)! Just follow the steps below for countless chances to win! Be sure to like us on Facebook for more chances to win. Good luck! All scrubs look amazing, especially Pucker up and Lavender :)! These scrubs would be amazing after a long day at work! Really excited for the Pucker Up Scrub!! I have tried perk lib scrub and I love it, and I love you so I want to also support you and the #1 blog since EVER and this AMAZING contest! I literally spent hours trying to find scrubs for a medical mission trip I have coming up. Love the color of figs scrubs. Already placed an order to buy two sets.